I have to be honest: I'm not the biggest fan of Halloween. I know, I know... I'm NO fun. Even my husband would agree. He loves all things spooky, creepy, and the opportunity to go out in full gory face paint. I don't know what it is about Halloween, but I'm just not that into it. That said, we usually do end up pulling together some plan to go out and celebrate and I have to whip out a costume at the last minute. 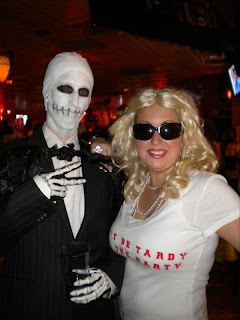 While I lucked out last year because we were honeymooning in Hawaii over Halloween, I have managed a last minute costume here and there over the past few years. 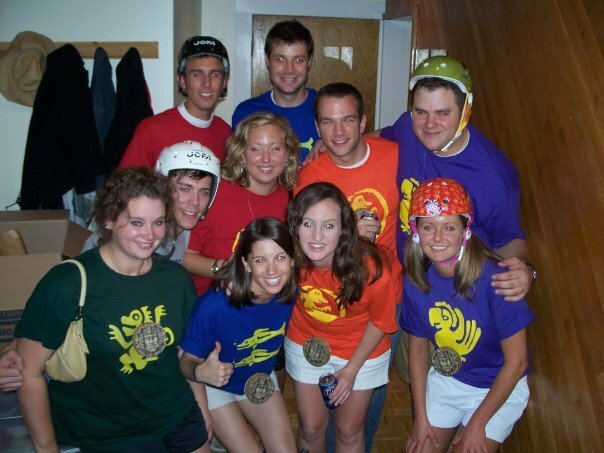 See below for Halloween 2007 when our friends all went as contestants from the old show Legends of the Hidden Temple. Costumes are much easier with a big group! And then there was Jack Skellington and Kim Zolciak of the Real Housewives of Atlanta (the shirt says "don't be tardy for the party"), Halloween circa 2010. This year we will be in L.A. this weekend prior to Halloween, but I have the gears turning in case I need to pull out a last minute costume for the following weekend. We've been watching a lot of Mad Men lately, so I was inspired to keep a Joan Holloway Harris costume on the back burner for this year. I think it's recognizable, stylish, and not too costumey, right? Plus, I already own that 1960's-ish Boden dress and the pumps, so I just need some period jewelry (including her signature gold pen necklace) and a red wig, of course. What do you think-- can I pull off Joan? Should I make Alex spray his hair gray and go as Roger Stirling? OH!! Those pumps are so gorgeous!